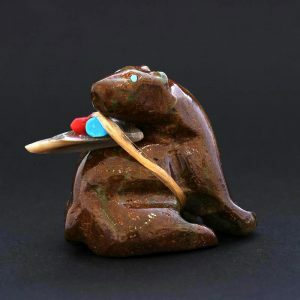 This old style Zuni badger fetish is carved from variscite by Evalina Boone. 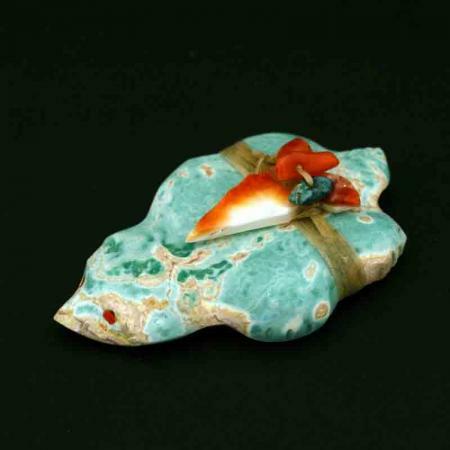 Badger is adorned with turquoise, coral and a shell arrowhead for protection. Badger is known to be aggressive and tenacious both traits that can help one accomplish or achieve a specific goal or purpose. Pueblo people also attribute healing properties to badger. This Zuni badger measures 4.5cm in length. 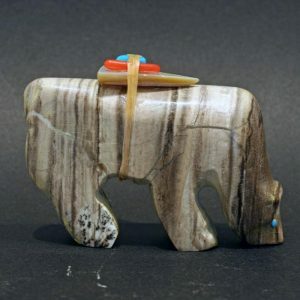 This old style Zuni badger fetish is carved from variscite by Evalina Boone. Badger is adorned with turquoise, coral and a shell arrowhead for protection. Badger is known to be aggressive and tenacious both traits that can help one accomplish or achieve a specific goal or purpose. Pueblo people also attribute healing properties to badger. 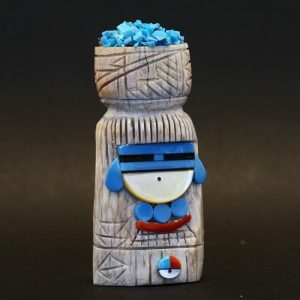 This Zuni badger fetish measures 4.5cm in length.